Son of the banker Hugo von Hofmannsthal. In 1891 he wrote his first play "Gestern" under the name of Theophil Morren. Around the same time he met the poet Stefan George and he started publishing poems in George's journal "Blätter für die Kunst". He studied law and philology, but after he finished his studies in 1901 he decided to concentrate on writing and he became a member of the group Jung Wien (Young Vienna). In 1901 he married Gertrud Schlesinger, the daughter of a Jewish banker in Vienna. She converted to Christianity before their marriage and they lived in Rodaun near Vienna and had three children. He first met the composer Richard Strauss in 1900 and from 1906 he started writing libretti for his operas. "Elektra" (1909) and "Der Rosenkavelier" (1911) were very succesful. They were followed by "Ariadne auf Naxos" (1912). During the First World War he worked for the government, writing speeches and articles. Together with Strauss, Max Reinhardt and Franz Schalk he founded the Salzburg Festival in 1917. The fall of the monarchy in Austra in 1918 was a shock to him. He continued writing plays and for Strauss he wrote the libretti for "Die Frau ohne Schatten" (1919) and "Die ägyptische Helena" (1927). On 13 Jul 1929 his son Franz commited suicide and two days later he suddeny died himself of a stroke at his home in Rodaun. 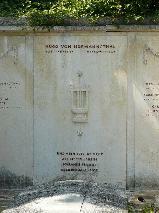 According to his own wishes he was buried in the habit of a Franciscan tertiary. "Arabella", his last collaboration with Strauss, premiered in 1933. 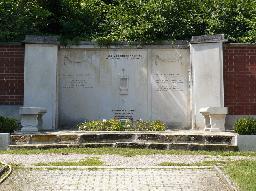 The grave of Hugo von Hofmannsthal at the Friedhof Kalksburg, Vienna.